A comet is defined as a body that displays a large, thin atmosphere at some point in its orbit, which can be of gas, of dust, or of both. This is called the coma, and from it develops a very tenuous hydrogen cloud and two tails, as in Plate 22. One of these tails consists of dust, the other of ionised gas. The coma can become as large as Jupiter, the hydrogen cloud larger than the Sun, and the tails as long as a few AU. As seen from the Earth, a comet can be a spectacular sight in the sky for several months. Figure 3.10 illustrates the growth and shrinkage of the tails versus the heliocentric distance as the comet goes around its orbit, indicating that heat from the Sun drives the activity. The source of the coma, cloud, and tails is a solid nucleus, typically a few kilometres across, and this is all that exists of the comet when it is in the outer Solar System. A comet's nucleus must contain sufficient quantities of icy materials to generate the coma, hydrogen cloud, and tails. This indicates that comets formed further out in the solar nebula than asteroids, sufficiently far that solid icy materials were present. Figure 3.10 The growth and shrinkage of the tails of a comet versus its heliocentric distance. they are inactive they are usually called something else - EKOs, Oort cloud objects, or, as you will see, dead comets. Cometary orbits fall into two main categories, long period and short period. As the names indicate, the categorisation depends on the orbital period. There is no sharp physical division, but the defining orbital period is exact. Long-period comets (LPCs) have orbital periods in excess of 200 years. In most cases the periods are greatly in excess of 200 years, with values extending up to about 10 Ma, and in many cases not measured. where k = 1 year AU-3'2. Thus, with P = 1Ma, a = 104AU. Such comets are observed only because they have highly eccentric orbits that bring them within a few AU of the Sun. A small number of LPCs arrive on parabolic or hyperbolic orbits, though this could be due to the perturbation of an eccentric elliptical orbit as a comet is on its way towards us. This perturbation can be caused by a close approach to a planet, or by an eruption of gas from the comet. Thus, there is no incontrovertible evidence for any comet having come from interstellar space, though this cannot be ruled out in some cases. 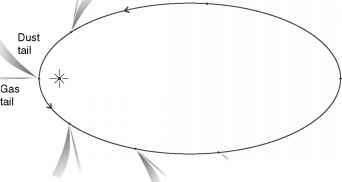 If a comet is leaving the inner Solar System on a parabolic or hyperbolic orbit, and if this orbit is not perturbed into an ellipse, the comet will certainly escape. The huge orbital periods of most LPCs mean that most of them have been observed only once in recorded history. About 1000 different LPCs have been recorded, and about 600 of these have well-known orbits. On average, about half a dozen LPCs are observed per year, and about one per decade becomes noticeable to the unaided eye. A spectacular example was Hale-Bopp in 1997 (Plate 22), and its orbit in the inner Solar System is shown in Figure 3.11(a). One of the factors that determines how spectacular a comet becomes is its proximity to the Earth. Another is its perihelion distance. If this is less than the radius of the Sun (poor comet!) or not much greater than this (Sun-grazing comets), then magnificent tails develop. The orbital inclinations of the LPCs are randomly distributed over the full range, as are the longitudes of the ascending node and of perihelion (Section 1.4.2). The LPCs thus bombard the inner Solar System from all directions. Short-period comets (SPCs) are defined as having periods of less than 200 years, and therefore they must have semimajor axes less than 34 AU - comparable with the outermost planets Neptune and Pluto. However, unlike the planets, most of the SPCs are in eccentric orbits, in some cases with e > 0.9 (Table 1.4). A few hundred SPCs are known. Of these, roughly half a dozen per year grow bright enough to be visible in a modest telescope. 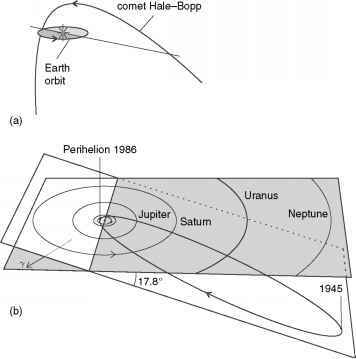 Figure 3.11 (a) The orbit of the long period comet Hale-Bopp in the inner Solar System. (b) The orbit of the short-period comet lP/Halley. 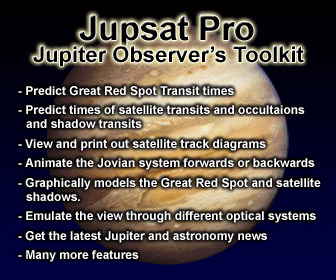 are prone to orbital changes through gravitational interaction with a planet, this is particularly so for the JFCs. This is because their low-inclination orbits, traversing the planetary zone, give a comparatively high probability of a close encounter with a planet. Such an encounter will result in a drastic alteration of the orbit, with an outcome that can be anything from solar capture to ejection from the Solar System. Nearly 200 JFCs are known, but survey limitations lead to estimates of the complete population up to a few thousand. In addition, with active lifetimes of the order of a few thousand years, and much longer dynamic lifetimes (before ejection or collision) estimated at about 0.3 Ma, there should be many dead JFCs. Assuming a steady-state population due to resupply, it is estimated that there could be roughly as many dead JFCs as active ones. On the other hand, if devolatilisation usually leads to complete destruction of the nucleus, there would be very few dead JFCs. The remaining SPCs are typified by the most famous SPC of all, lP/Halley, and so they are called Halley family comets (HFCs). The P denotes a measured period. The members of this small group have periods in the range 15-200 years, and their inclinations are typically larger than for the JFCs, with a few in retrograde orbits. In the 15-20 year period overlap with the JFCs, the distinction between HFCs and JFCs is made on the basis of a comet's orbital elements a, e, and i taken together, in what is called the Tisserand parameter. Its value for the HFCs is distinct from that for JFCs. Consult books on celestial mechanics (Further Reading) for the details. Halley's comet itself has an orbital period of 76 years and an orbital inclination of 162°, i.e. retrograde (Table 1.4). It has been observed every 76 years or so, as far back as reliable records go - at least as far back as 240 bc. One of its more famous apparitions was in the year of the Battle of Hastings, ad 1066. It is named after the British astronomer Edmond Halley (1656-1742), who noticed that the orbits of the bright comets of 1531, 1607, and 1682 were very similar. He deduced that this was the same comet each time, and he predicted its reappearance in 1758. Halley's comet duly appeared, but alas Halley had died 16 years earlier. It was last at perihelion on 9 February 1986, and in March 1986 it became the first comet to be imaged at close range by a spacecraft. Figure 3.11(b) shows the orbit of Halley's comet. The number of known HFCs is smaller than the number of known JFCs, but because of their generally higher inclinations and longer periods, it is very likely that a smaller proportion of the HFC population has been discovered than in the case of the JFCs. It is estimated that there could be about twice as many HFCs as JFCs in the complete populations. Like the JFCs, it is assumed that the HFC numbers are roughly in a steady state due to resupply. The coma that grows when a comet comes typically within 10 AU or so of the Sun is a result of the heating of the nucleus by solar radiation. The coma is a large, tenuous atmosphere, consisting of gases derived from the more volatile constituents of the nucleus, mixed with dust carried aloft by the outgassing. Spectroscopic studies, and measurements made by spacecraft, have shown that the dust in the coma consists of rocky materials like silicates and carbonaceous materials. Such studies also show that except in the innermost part of the coma the gases are predominantly fragments of molecules, rather than intact molecules. Such fragmentation is to be expected as a result of the disruptive effect of solar radiation. This is called photodissociation, and UV photons are particularly effective. The fragments, and intact molecules, can also be ionised in a process called photoionisation, where a solar UV photon ejects an electron. From the molecular fragments, the parent molecules can be identified. Hydrogen atoms (H), hydroxyl (OH), and oxygen (O) atoms are particularly common, and must have been derived from water molecules (H2O). Other molecular fragments have been derived from carbon dioxide (CO2) and carbon monoxide (CO). H2O, CO2, and CO have also been detected as intact molecules in the coma. From the relative abundances of molecules and fragments in the coma, it is inferred that the predominant volatile constituent of the nucleus is water, typically accounting for over 80% of the mass of the volatile substances. CO and CO2 are the next most abundant volatiles. Note that these substances would be present in the nucleus as solids. They are sublimed from the nucleus to form gases, and are then photodissociated and photoionised. The more volatile the material, the greater the heliocentric distance at which it can sublime. Water sublimes inwards of about 5 AU, and becomes the main driver of activity. CO2 sublimes further out. CO is the driver well beyond 5 AU, and thus triggers activity in the LPCs as they move inwards, provided that previous journeys through the inner Solar System have not removed all the CO. The hydrogen cloud is derived from the coma through the photodissociation of the molecular fragment OH. Even though the cloud can greatly exceed the size of the Sun, there is very little mass involved. The tails can likewise be huge, extending as far as a few AU from the coma, but they are also very tenuous, so again little mass is present. There are two sorts of tail: a tail stretching almost along the line from the Sun to the coma, and a curved tail that points away from the Sun only in the immediate vicinity of the coma (Plate 22 and Figure 3.10). The spectrum of the radiation received from the curved tail shows it to be a solar spectrum modified in a way consistent with scattering from micrometre (^m) sized dust particles. Therefore, this is a dust tail, and it is seen by the solar radiation that it scatters. By contrast, the radiation from the straight tail shows it to consist of electrons and ionised atoms, plus a trace of very fine dust with particle sizes less than 1 ^m. The evidence is a very weak spectrum like that from the dust tail, and strong spectral lines emitted by the ions, consequent upon absorption of solar radiation. This is the ion tail. One common ion is OH+, produced from OH in the coma by photoionisation. All the ions that have been identified in the ion tail could have been produced by the ionisation of atoms and molecular fragments in the coma. It is the strikingly different composition of the two tails that causes their separation in space as they stream away from the coma. The ion tail is swept from the coma by the force exerted on the coma ions by the magnetic field in the solar wind as the field moves across the ions. The details are complicated, but the outcome is that the ions are swept in the direction of the solar wind, i.e. radially from the Sun. The wind speed is much higher than the orbital speed of the comet, so in the time it takes an ion to travel from the coma to where the tail is no longer distinguishable, the comet does not move very far. Consequently, the tail is fairly straight. Because of the intricate structure of the solar wind, the ion tail is highly structured, with filaments and knots, and it can temporarily break away from the coma. The trace of submicrometre dust in the ion tail is carried by the ion flow. The dust tail is driven from the coma through bombardment by the photons that constitute solar electromagnetic radiation. These carry momentum (as you saw in Section 3.1 in relation to the Yarkovsky effect), and the resulting force on a dust particle is called radiation pressure. The dust is driven away from the Sun, but only reaches speeds comparable with the orbital speed of the comet. □ So, why is the dust tail curved? This tail is curved because the comet moves appreciably around its orbit in the transit time of the dust to the end of the visible tail. The smaller the particle, the greater the acceleration caused by radiation pressure. This is because the area-to-mass ratio is greater for smaller particles, as discussed in relation to the Poynting-Robertson effect (Section 2.3.2). As a result, particles in the coma much greater than a few tens of micrometres in size are retained. The greater effect of radiation pressure on smaller particles raises the question of why it is not an important force on the ions in the tail. This is because, when the particle size is less than the predominant wavelength of the photons, the interaction is enfeebled. For solar radiation the predominant wavelength is about 0.5 ^m, which is very much greater than ion radii. Often, more than two tails are seen. These extra tails are usually ion or dust tails with slightly different properties, such as the thin tail of neutral sodium atoms seen streaming away from the comet Hale-Bopp. In January 2006 the NASA Stardust mission returned to Earth with a sample of dust from the vicinity of the comet 81P/Wild 2. Analyses of these samples is providing further information on the composition of comets (Section 3.2.3). From their starlike images in all but the largest telescopes it has long been known that cometary nuclei are small. Size can be estimated in a similar indirect manner to asteroids (Section 3.1.3), but the uncertainties are great. Sizes of the order of a few kilometres are typical, extending up to a few tens of kilometres for the largest comets. The composition of the nucleus can be deduced from the composition of the coma, as indicated in Section 3.2.2. The typical nucleus is deduced to consist of ices, predominantly water, mixed with some CO2 ice and CO ice, plus rocky and carbonaceous materials. A great variety of other molecules and molecular fragments have been identified in comas and ion tails, implying the existence of small quantities of other icy substances in the nuclei of some comets. Methanol (CH3OH), methanal (HCHO), and nitrogen (N2) are usually the most abundant traces inferred to exist. Some traces in some comets indicate that the icy dust grains that formed their nuclei are interstellar material that has not been heated above about 100 K. On the other hand the LPC Hale-Bopp has isotope ratios for C, N, and S that are the same as in the Solar System in general, indicating that Hale-Bopp's icy grains recondensed from a well-mixed solar nebula. □ Why does this suggest that Hale-Bopp comes from the Oort cloud? Solar nebular theories derive the Oort cloud from icy-rocky planetesimals that condensed in the giant region (Section 2.2.6). Therefore, the composition of Oort cloud comets is expected to resemble that of the nebula. An origin in interstellar space is unlikely because interstellar dust grains were modified by evaporation and condensation in the solar nebula (Section 2.2.2). An origin in the inner E-K belt, which was at least partly populated from the giant region (Section 2.2.6), is ruled out by the long period. The low abundance of neon in Hale-Bopp supports a giant region origin. Except in its inner part, the E-K belt would have been cold enough for neon to condense from the solar nebula, and so neon would now be a more significant component of Hale-Bopp. Our knowledge of cometary nuclei received a huge boost in 1986 when five spacecraft made close observations of 1P/Halley. The European Space Agency's Giotto flew closest, sweeping past at a range of only about 600 km from the nucleus in March 1986, obtaining the image in Figure 3.12(a). Halley was then within 1AU of the Sun, only a few weeks after its perihelion at 0.53 AU. Consequently, its tails were well developed. The peanut-shaped nucleus is 16 km long, and 8 x 7 km in typical cross-section. It rotates around its long axis with a period of 170 hours, and this axis precesses with a period of 89 hours around an axis inclined at 66° with respect to the long axis. has yielded similar densities, though with much greater uncertainty. The fragility of cometary nuclei is indicated by several that have broken up through their degassing as they approached the Sun, or in the case of Shoemaker-Levy 9 by a close approach to Jupiter. The spacecraft observations of the coma of Halley's comet, supplemented by ground-based observations, added many details to our knowledge of the composition of the nucleus, but did not change the broad picture very much. It is deduced that Halley's nucleus consists of 80% water, 10% CO, 3.5% CO2, by numbers of molecules. Definite evidence for methane ice (CH4) was not obtained, even though this was expected to be relatively abundant. An important detail is evidence that some of the water is probably present in chemical combination with rocky and carbonaceous materials, as water of hydration. Moreover, it seems likely that proportions of the different icy materials are present in what are called clathrates, where one material is enclosed in the crystal structure of another. In particular, the rather open crystal structure of water ice can readily enclose molecules of other icy substances, such as CO2. The Giotto flyby also confirmed that cometary nuclei can be very dark. Halley has a geometrical albedo of only 3-4%, the result of carbonaceous materials at the surface. Low albedos have since been established for the nuclei of other comets. It seems that, as the icy materials evaporate near the Sun to give the coma and tails, a residue of dust depleted in icy materials concentrates at the surface, where it forms an insulating protective crust over the ice-rich grains beneath. This crust is broken by the vents that spew forth the coma and tail material. Vents tend to switch on when they face the Sun, and switch off when they turn away from the Sun. For lP/Halley this phenomenon is apparent in Figure 3.12(a). Vents can explain the transient brightening that some comets exhibit when they are more than a few AU from the Sun. Slow evaporation beneath the protective crust would build up the gas pressure to the point where the fluff ruptures, and a vent forms. An interesting example is 29P/Schwassmann-Wachmann 1, which has a nearly circular orbit between Jupiter and Saturn (Table 1.4). Though it is fairly large for a comet - about 40 km across - it would have gone unnoticed but for its outbursts, which occur every year or so. Halley suddenly brightened in 1991, when it was 14 AU from the Sun. This might have been due to a large solar flare which caused shock waves that ruptured the crust. Since the flybys of 1P/Halley there have been a few more missions to comets. On 22 September 2001 NASA's Deep Space 1 flew past 15P/Borrelly, then 1.36AU from the Sun and 8 days after perihelion. Deep Space obtained many images, one of which is shown in Figure 3.12(b). You can see that it is a very irregular object, with a longest dimension of 8 km. Its albedo is typically low for a comet's nucleus, only 0.03 and even less in patches - down to 0.007. As for comets in general, this is presumed to be a carbonaceous crust overlying an ice-rich interior. About 90% of its surface is inactive, though a jet on one side makes it visible from Earth. The NASA Stardust mission in January 2006 returned dust to Earth from the vicinity of JFC 81P/Wild 2. It also imaged the nucleus, a rugged surface, with an albedo of about 3%. There were four to five jets, and circular features that might be impact craters. It is about 5 km across, and has a roughly spherical shape, indicating that it might not be a fragment from a collision. The dust particles contain the sort of materials expected to have been present in the cool outer Solar System, but there are also silicates, including those from the olivine group, that form at high temperatures. These could have been placed in the outer Solar System by jets from the young Sun, or might be pristine interstellar grains, forged by other stars. Further analysis will rule out one of these two possibilities. Perhaps the most dramatic mission so far was that of NASA's Deep Impact, which, on 4 July 2005, fired a 370 kg copper bullet at 10.2kms-1 into 9P/Tempel 1, a 14 x 4.4 x 4.4 km JFC, when it was near its 1.51 AU perihelion on 5 July. The goal was to obtain the internal composition. The ESA Rosetta spacecraft made observations before, during, and after the impact. The water content of the ejected dust was measured, and was found, surprisingly, not to be the dominant constituent. Non-icy materials dominate, and though this might be local to the impact site, it is feasible that at least some comets are 'icy dirtballs' rather than 'dirty snowballs'. The activity induced by the impact died after a few days, indicating that such impacts on the crust from meteoroids are not the cause of the longer lived cometary outbursts. The crust on a JFC's nucleus is estimated to have formed within about 0.1 Ma of its joining this family. For any comet the time taken depends on the accumulated time spent close to the Sun for the surface to devolatilise. But it is possible that comets first arrive with some sort of crust already in place. Prolonged exposure to cosmic rays and UV photons chemically transforms and devolatilises the surface, to form a 1 metre crust in the order of 100 Ma. This is much shorter than the average residence times in the sources of comets - the Oort cloud and the E-K belt (Section 3.2.5). But it is the subsequent growth of the crust that ends activity, and leads to the death of comets. In 150-200 words, describe the visual appearance of a comet from when it is about 30 AU from the Sun on its way in, to when it is outgoing at the same distance. Relate the visible changes to events at the nucleus. When beggars die there are no comets seen: the heavens themselves blaze forth the death of princes. Comets die too, because the loss of volatiles is acute within a few AU of the Sun. If perihelion is at 1 AU then the order of 100 perihelion passages will suffice to evaporate all the available ices from a nucleus of typical size, leaving it with a crust so thick that the nucleus no longer has the capability to develop a coma and tails. In some cases this devolatilisation could extend to the centre, in which case the final act of the nucleus is to become dust, perhaps violently. Models indicate that any nuclei smaller than about 1 km across can lose their remaining volatiles sufficiently rapidly to explode. In less extreme cases there is a gentler dissolution to dust. A rapid, jet-driven increase in rotation rate could also disrupt small nuclei. Disruption explains the paucity of small nuclei. Comets are seen in such last throes of activity - some of the SPCs have very small comas and tails. For example, 133P/Elst-Pizarro shows a very feeble, thin tail. The Infrared Astronomical Satellite (IRAS) that gathered data for nearly the whole of 1983 discovered many Solar System objects with small dusty envelopes. Some of these might be asteroids that never had ices, but are surrounded by fine collisional debris; others might be devolatilised comets. Elsewhere in the Solar System some members of the low-albedo classes of asteroid, such as the C and D classes, might also be devolatilised comet nuclei. The reflectance spectra and albedos of cometary nuclei resemble those of these classes. For example, Hidalgo (Section 3.1.2) is a D class asteroid with a perihelion of 2.01 AU but with an orbit so eccentric that it has an aphelion of 9.68 AU, unusually distant for an asteroid, and so it is a good candidate for being a comet remnant. Within the asteroid belt there are a few comets that seem to be nearly dead: 133P/Elst-Pizarro orbits in the asteroid main belt, as does the rather more active 2P/Encke, with a period of 3.3 years. Some of the small satellites of the giant planets, particularly those in unusual orbits, might also be cometary remnants, captured by the planet. Support for the view that some asteroids are dead comet nuclei comes from the Tisserand parameter (Section 3.2.1). Its value is distinct from asteroid values, except for some of the asteroids with albedos around 4%, a value similar to comet nuclei. The most dramatic termination of a comet's life is when it collides with another body. As well as collisions with the Sun (Section 3.2.1), collisions with planets also occur. One such was seen in July 1994 - the collision with Jupiter of D/1993 F2 Shoemaker-Levy 9, or rather its fragments. There must have been many other collisions with the planets, including the Earth. Some SPCs have orbits that resemble the Amor and Apollo asteroids, and it is thought that some of these are devolatilised cometary nuclei. The collision of one such nucleus with the Earth might account for the huge explosion in 1908 in the Tunguska River area of central Siberia, though a small asteroid proper is another possibility (Section 3.1.2). There is archaeological evidence for earlier impacts, and in the future the Earth must surely collect further comets. Calculations show that dead JFCs could account for up to 50% of the NEAs. As well as perihelion distance, what other orbital property influences the mass of volatile material lost by a comet per orbit? Justify your answer. In Section 3.2.1 an estimate of the active lifetime of a JFC was given. Reconcile this with the statement in this section that a comet survives the order of 100 perihelion passages before it becomes inactive. By now, you will have gathered that there are two sources of comets, the Oort cloud and the E-K belt. These source populations are not called comets - that name is reserved for bodies in orbits such that a coma develops along some part of it. In the sources the bodies are called Oort cloud members and EKOs. In Sections 1.2.3 and 2.2.6 brief descriptions of the Oort cloud and the E-K belt were given. The Oort cloud is a spherical shell of icy-rocky bodies extending from about 103 to 105AU. The E-K belt extends inwards towards the Sun to around the orbit of Pluto, and has a flatter distribution, the objects having low to modest inclinations. As well as being the sources of comets, the Oort cloud and the E-K belt are interesting in their own right, so we describe each of these populations now, and how the comets come from them. The origin of the Oort cloud was described in Section 2.2.6. You have seen that the members of the cloud are thought to be icy-rocky planetesimals flung out by the giant planets. □ According to the giant planet migration model in Section 2.2.5, which region was a particularly copious source of Oort cloud members? The Uranus-Neptune region would have been a particularly copious source of icy-rocky planetesimals flung outwards. Many were ejected not quite hard enough to escape into interstellar space. The cloud is a thick spherical shell of 1012-1013 bodies greater than 1 km across, 103-105 AU from the Sun (Figure 3.13). In spite of the huge number of comets in the cloud, the total mass is estimated to be only of the order of 1025kg, about the same as the Earth's mass. The cloud is too far away to be observed directly. Its existence has long been inferred from the LPCs. You have seen that the orbits of the LPCs have aphelia far beyond the planets, and that the aphelia lie in all directions from the Sun. This led the Estonian astronomer Ernst Julius Opik (1893-1985) to suggest in 1932 that there was a huge cloud of comets surrounding the Solar System, but so far away that only those members with perihelia less than a few AU became visible, through the growth of coma and tails. 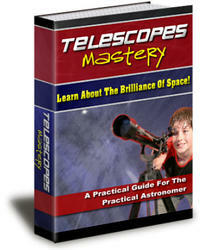 In 1950 this idea was developed by the Dutch astronomer Jan Hendrick Oort (1900-1992). The Oort cloud is sometimes known as the Opik-Oort cloud.